La Liga giants Barcelona, home to Lionel Messi, are the best paid team in global sport and the first sports team in history to have average basic annual pay of more than £10m according to Sportingintelligence’s Global Sports Salaries Survey (GSSS) for 2018, published today. 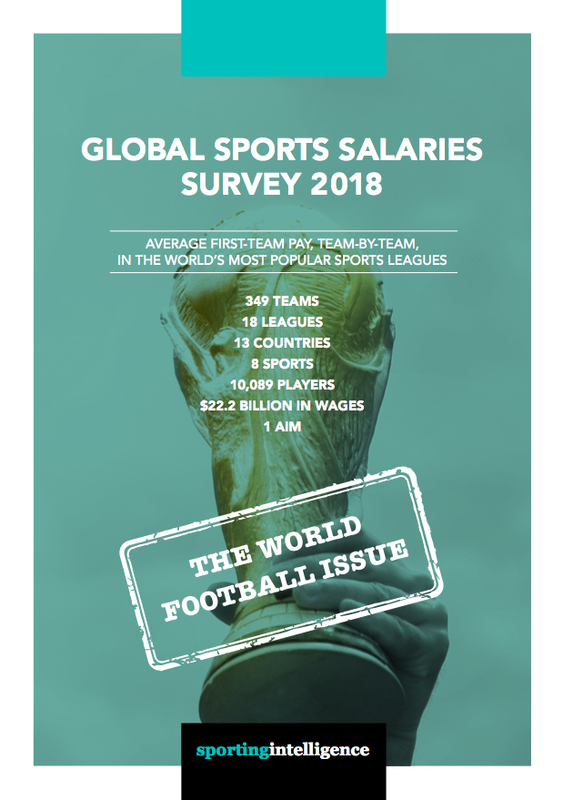 This year’s GSSS is a 114-page ‘World football’ special edition with features that examine (i) how accurately pay levels can predict World Cup results; (ii) average pay levels in 68 football leagues around the world; and (iii) the downside of clubs having so much money in the Premier League that they end up paying huge ‘PL premiums’ for transfer fees and wages. Barcelona return to the top of the pay rankings in this ninth edition of the GSSS for the first time since our 2012 report. The average annual basic first-team salary at the Nou Camp is currently £10,454,259 (that’s £201,043 per week) in late November of the 2018-19 season, according to the GSSS research. Barcelona are well clear at the top of this year’s list, but their fiercest domestic rivals, Real Madrid, have managed to climb to second place. Average basic pay at the Bernabéu is £8,089,582 per year (or £155,569 per week). In third place this year are last year’s No1 team, basketball’s Oklahoma City Thunder of the NBA, on £7.85m per year on average, followed by two other NBA teams, the Golden State Warriors (£7.82m) and the Washington Wizards (£7.6m). That NBA trio break new ground of their own by becoming the first NBA teams – or indeed American teams from any sport – where average basic pay is more than $10m (US dollars) per player per year. The unique metric of the GSSS is ‘average first-team pay’ – allowing the best like-for-like comparison between vastly different sports in leagues and countries around the world. Six of the top 10 payers in this year’s GSSS are NBA teams – an ongoing consequence of a huge new TV deal in the NBA that kicked in before the 2016-17 season. As recently as the 2015 GSSS, there were eight football teams in the top 10. This year there are four: Barcelona, Real Madrid, Juventus and Manchester United. The top dozen teams are summarised in the accompanying graphic and details for all teams are in the full report. The survey found the best paying English football clubs to be Manchester United and Manchester City, at No10 and No20 in the list, respectively paying just over £6.5m and nearly £6m basic per man. Trophies or other successes will result in higher final pay via performance-related payments and bonuses. Other extras will accrue to many players (in all sports) through annualised signing-on fees and loyalty payments. These are not included in our figures as they are not always guaranteed. A player due a loyalty bonus for completion of a given season, for example, doesn’t get it if he leaves. The full methodology and sourcing notes for the GSSS is detailed in the introduction. The NBA again extends its lead as the best paying league by average salary (£5.9m) ahead of IPL cricket (£3.8m when weekly pay is annualised) and MLB baseball (£3.4m). The Premier League remains the world’s best paying football league by a margin. Average pay in the 2018-19 season in England’s top division is now £2,990,726 (or £57,514 per week). The next best paid leagues by average pay are the NFL (gridiron), La Liga (football), NHL (ice hockey), then Serie A, the Bundesliga and Ligue 1 (all football). Those are the top 10. Much more detail, and analysis by league, and numbers for every team in these leagues and others are in the full GSSS 2018, available free as a PDF. The GSSS looks solely at earnings for playing sport, not for endorsements or other extra-curricular activities. It considers 349 teams in 18 leagues across 13 countries in eight sports: football, baseball, basketball, two types of gridiron, cricket, ice hockey and Australian Rules football. The GSSS features salary information for the most popular professional domestic sports leagues in the world, by average attendance per game, for which we have been able to obtain reliable data, as well as various other leagues from the world’s most popular sport, football. 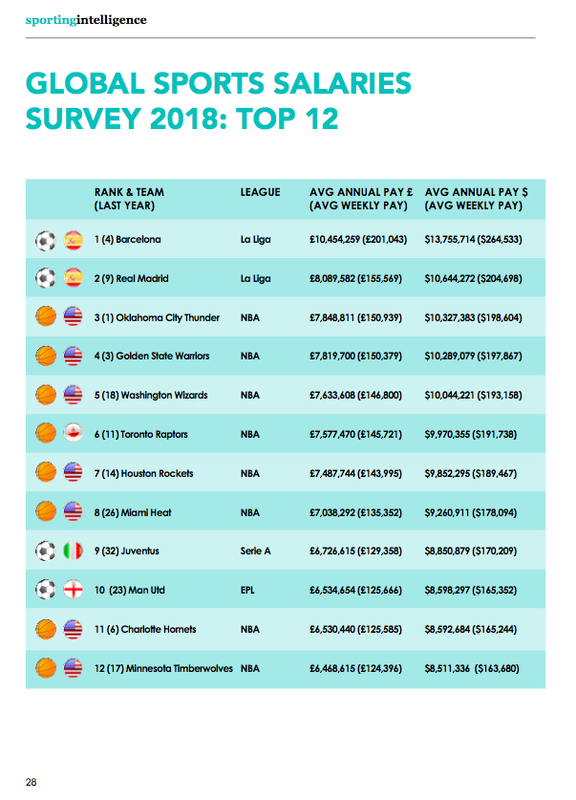 The 18 leagues are, in order of highest to lowest average salary across those leagues: the NBA, IPL, MLB, Premier League, NFL, La Liga, NHL, Serie A, Bundesliga, Ligue 1, Chinese Super League, NPB (Japanese baseball), MLS, J-League, AFL (Aussie Rules), Scottish Premiership, Canadian Football League (gridiron) and the WNBA. The World Cup itself, examining how well we can predict it based on the salary levels of the participants, using pay as a proxy for talent. Assuming that pay and performance are related, we look at who underachieved most and who punched above their weight in Russia. That’s on pages 14-15. Average pay levels in the top football divisions of assorted nations around the world. This report contains an in-depth look, club by club, at the ‘Big 5’ leagues of Europe plus the top football divisions in China, North America, Japan and Scotland. The wider survey attempts to find an average pay gure for every top-flight league in Europe and others scattered globally. That’s on pages 17-21. How much bang are top football clubs getting for their buck? 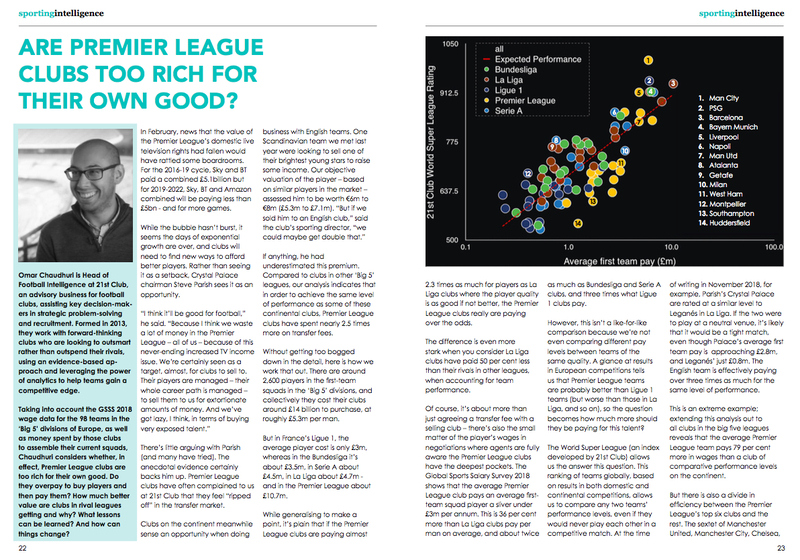 In a special contribution from the brilliant folk at 21st Club, their Head of Football Intelligence, Omar Chaudhuri, examines (right) which clubs are out-performing their spending – and why – and which are doing the opposite. He also examines whether some clubs, not least in the Premier League, are, in effect, just too wealthy for their own good. That’s on pages 22-25. As a special extra, the GSSS 2018 includes a fascinating insight from 21st Club’s sister company 15th Club, who work not in football but in golf. The team at 15th Club worked with Europe’s team at the 42nd Ryder Cup in September, staged on the Albatros Course at Le Golf National in Guyancourt, France. Europe ran out comfortable winners, by 171⁄2 points to 101⁄2, and Dan Zelezinski of 15th Club explains (on pages 36-39) how some of the analytics principles that assisted in that triumph might be applied to help professional golfers win more – and therefore earn more. Selected coverage of last year’s report, the GSSS 2017 on Forbes, The Guardian, The BBC, The Australian, ESPN, Aberdeen Evening Express,New Zealand Herald, PrimaOnline, Corriere Dello Sport, (and La Repubblica), Figaro, Mundo Deportivo, Tribal Football, Fotbollskanalen, Hufvudstadsbladet, AS (Spain), Newcastle Chronicle, Goal (Brazil), The Wire, Record (Portugal), Business Insider, The42, Daily Sabah, AS (US), Loughborough Echo, Aftonbladet, Dundee Courier, Origo (Hungary), The Glasgow Herald, Telegraf (Ukraine), The Scottish Sun, Sportbuzzbusines, France, Soccer Laduma, Globo, Aberdeen Express, Eldesmarque, Levante, The New News (Fr), and coverage in Poland, Hungary, Croatia, Greece, ESPN Brazil, Indonesia, Mirror, China (various), Korea, Vietnam. And assorted others.